I've spend almost a week tweaking a world borders dataset. Since I need a dataset which I can use without restrictions, I had to dig into the public domain world. I found a proper dataset on the Mapping Hacks website. The original dataset was derived by Schuyler Erle from public domain sources, while Sean Gilles has done some clean up and enhancements. Polygons representing one country/area are merged into one feature. Added ISO 3611-1 Country codes (alpha-2, alpha-3, numeric-3). Various feature changes to make the dataset more compatible with ISO 3611-1. Added region and sub-region codes from UN Statistical Division. Added longitude/latitude values for each country. More information on this page and in the "readme.txt" file provided with the dataset. You can download the the dataset in two resolutions. I recommend the simplified version for thematic web mapping. 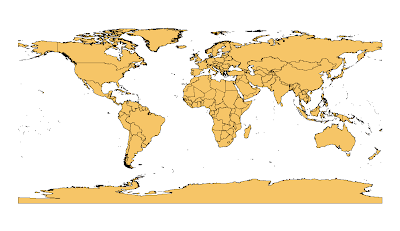 The dataset could be further optimised by removing small island polygons that are not individual countries. Fantastic work! I've been looking for a world border dataset like this for a LONG time. TM_WORLD_BORDERS-0.1.zip.zip, and cannot find TM_WORLD_BORDERS-0.1.zip.ZIP, period. The shapefiles should be ok, but they are zipped on a windows computer using 7-Zip (www.7-zip.org). I'm not familiar with the unzip Linux command. New zip archives are now available on this page. Whatever the nuances of copyright/database law in your area, can I assume you intend this dataset resulting from your modifications to be in (or essentially) also in the public domain? The Readme file is a bit unclear on this topic. This dataset is available under a Creative Commons Attribution-Share Alike License. I will add this information to the Readme-file. I'm curious if you have given thought to reprojection issues with this dataset? I'd like to use it for tutorials involving reprojection but it appears that the use of multipolygons can cause havoc near the dateline. This does not happen with the world_borders.shp from mapping hacks. Good to see that this dataset is used in an open source project. I've not given thought to reprojection issues width this dataset. I think you're right about multipolygons, - being on both side of the dateline might cause some problems for some projections. Maybe splitting multipolygons that cross the dateline will solve your problem? Please notify me if you're able to find a solution. There is a small (but funny) bug in the dataset. The "United Arab Emirates" are mistyped as "Untied Arab Emirates", at least in version 0.2 (which is what i'm using right now). Of course if anyone else digs into the issue please post here! The downloadlink isn't working anymore. Could you provide some help? The download link seems to work here. How up-to-date are the political boundaries? Circa 2008, or earlier? This is great work indeed, Bjørn. Could you explain how you went about the simplification to get it from 3.3 MB to 226 KB? The simplification process is described in this document (PDF). I have a problem though, can you divide Sudan to "Sudan" and "South Sudan"? I need South Sudan in the list of countries. Can you also add Alderney or at least combine it with Guernsey to form Guernsey and Alderney? This dataset is no longer maintained. You'll find the same data on www.naturalearthdata.com. Hi! I used your map, but I noticed that "Occupied Palestinean Territory" miss in the file ".dbf". Thank you for a great map! If I may, I'd like to ask for a version where Kosovo is separated from Serbia, as 108 UN-countries, including my own, recognize its independence. Also, it is relevant for my use of the map, as my data separates the two entities. South Sudan is also a country that I'd like to see in this map, as it is a member state of the UN.